You probably already know that Environment variables can be defined at either machine scope, or user scope. The value at the user scope typically overrides the value defined at machine scope. It appears that for Windows Services that run under the SYSTEM account, even though there's a user-specific environment variable, a different %TEMP% is used. I can't find any documentation on this feature, but environment variables are inherited by processes from their parent. Services are owned by services.exe, which is owned by wininit.exe. 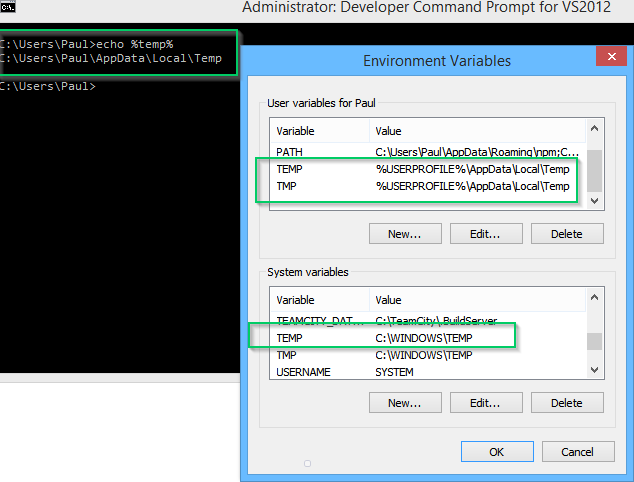 Using Process Explorer, wininit.exe's environment variables set TEMP to C:\Windows\TEMP. My guess is this is probably a backwards compatibility feature for old Windows Services that relied on using C:\Windows\TEMP.